Although advances have been made in reconstruction of the anterior cruciate ligament, there are still issues. Researchers are looking at the effectiveness of the surgical technique and how tunnel placement can help improve outcomes. The authors describe their technique and offer insights on optimizing ACL repair. Anterior cruciate ligament (ACL) reconstruction has undergone a considerable evolution  over the past 50 years as orthopaedic surgeons better understand the ACL anatomy, particularly how to identify, map, and analyze the ligament’s femoral and tibial insertion sites. [2-6]. In this article, we will describe our in-house surgical technique for ACL reconstruction and offer additional insights to optimize ACL repair. In the chronic setting, the main indication is recurrent giving way. With respect to the role of ACL reconstruction in preventing osteoarthritis, the evidence is scarce. According to Wong et al, the published literature does not support the view that ACL reconstruction prevents osteoarthritis, although it might prevent further meniscal damage. Indeed, some papers support the finding of a decreased risk of meniscal injury after early ACL reconstruction versus a conservative treatment or late reconstruction [15-17], while others have found no benefit . Technical considerations concerning installation, construction, and orientation of the tunnels are summarized in Table 1 and discussed below. The patient’s position is crucial. He or she is supine and the limb is securely held in a mechanical mobile support that allows the surgeon to modify the knee flexion angles during the procedure. When the TT technique is used, the foot is hanging free and the limb can easily be manipulated. When the AM portal is used, the foot is positioned on the operating table. The authors prefer to work with a low-pressure tourniquet (200 to 220 mm Hg). The tourniquet is placed 15 cm proximal to the upper patellar pole to allow sufficient room for handling pins and pull out sutures. The medial and lateral side of the knee are easily accessible, should meniscal suture or additional posteromedial or posterolateral portals be needed. 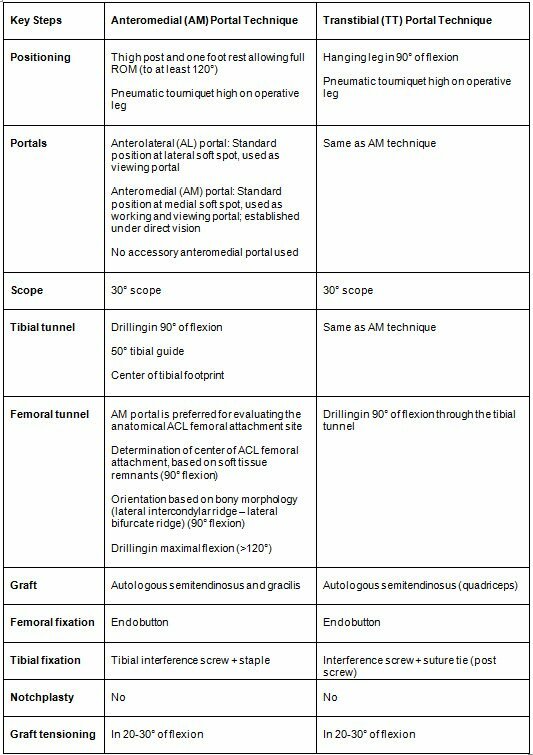 Using classic AM and anterolateral portals, arthroscopy starts with a thorough evaluation of all compartments of the knee. 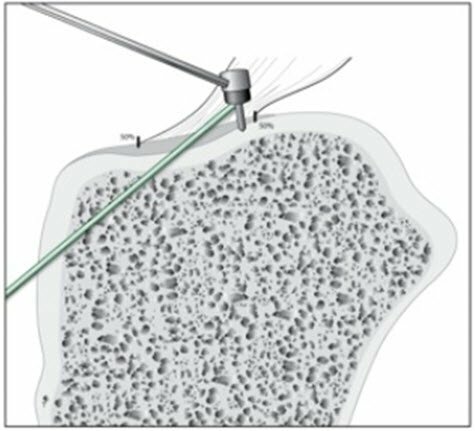 If required, meniscal suturing is performed, combining vertical mattress sutures with an outside-in guide system and all-inside suture devices. The nature of the ACL tear is carefully evaluated. It is crucial not to shave away the stump on the tibia or femur. The remaining stump is an excellent landmark for positioning the drill guide. In analyzing the tibial stump, keep in mind that native ACL anatomy is highly variable (Figure 1). The double-bundle concept is an attractive simplification of reality with a native ACL that typically displays many different bundles to be distinguished (Figure 1). Figure 1. Images of normal ACLs, showing great variability in appearance. The authors prefer reconstruction with a single-bundle technique. The aim is to position the quadruple semi-tendinous graft exactly in the middle of the remaining tibial ACL stump, in the anteroposterior (AP) and mediolateral (ML) planes. Be aware of the hook that is a feature of most tibial guides. The exit point of the guide pin will be anterior to the position of the guide hook. Consequently, the guide must be positioned posterior to the midpoint of the stump in the AP plane. (Figure 2). Figure 2. The position of the hook of the guide on the bone is not the exit position of the guide pin. The guide pin exits the bone anterior to the hook of the guide. Apart from the exit point in the joint, the orientation of the tibial tunnel is important. In the sagittal plane, the authors aim for an angulation of 50°; in the frontal plane 30°, relative to the tibial mechanical axis. It can be treacherous to position the tibial tunnel too horizontal in the frontal plane, as it could dangerously approach the articular cartilage, possibly even lifting the cartilage on the tibial plateau (Figure 3). Figure 3. The tibial tunnel is positioned too far horizontally, which can create a conflict with the tibial medial articular cartilage and should be avoided. Figure 4. The relative position of the center of the graft insertion area on the tibia for 20 patients, as determined by CT scan. The position is very close to the anatomical center of the stump, with a slight deviation towards medial and posterior. The TT technique allows for drilling of the femoral tunnel at the anatomical insertion of the AM bundle of the ACL. 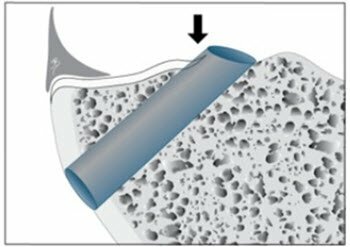 The advantage of this technique is the possibility of visualizing the notch wall during the drilling of the guide pin and the soft angle made between the articular portion and the intra-femoral portion of the ACL graft. To ensure correct placement, the surgeon must control the flexion angle of the knee. With a fixed flexion angle of the knee at 90°, the guide pin is likely to enter the femur at a point remote of the anatomical insertion of the AM bundle. The anterior border of the tunnel is always softened with a curette to avoid abrasion of the graft in deep flexion. When the AM portal is used for drilling the femoral tunnel, the entry into the lateral condyle can be positioned more toward the posterolateral bundle. The main disadvantage is the lesser visualization as the knee must be positioned in hyperflexion. Consequently, a good offset guide that hooks behind the femoral condyle is preferable. Figure 5. Femoral distribution of the tunnel position (Figure 5a, left). Using the TT technique, the mean femoral tunnel is positioned slightly more anterior and higher (black dots), whereas the AM portal technique places the average tunnel slightly lower and more posterior with lesser variance. Figure 5b (right) shows smaller angle between tunnels (red: tibial tunnel/blue: femoral tunnel) using the AM technique (left), with significantly shorter femoral tunnels. The best of both worlds can probably be achieved by using an outside-in guide that allows the surgeon to combine free choice of the femoral insertion position with optimal tunnel orientation. Autologous hamstring grafts are used for single-bundle reconstruction. Semi-tendinosus and gracilis grafts are harvested and prepared as a quadruple graft. For tibial fixation, bioabsorbable screws are used, in a size-to-size manner, in combination with a staple or post screw. Femoral fixation is performed using an endobutton (Smith & Nephew, London, England, UK). Fixation is done after manual tensioning with the knee in 10-20° of flexion. For the first 2 weeks after surgery, partial weight-bearing with use of 2 crutches is advised. The use of crutches is phased out after 2 weeks, depending on hamstring/quadriceps control. Bracing is recommended for 4 weeks after surgery, with limited range of motion allowed (week 0-2: 0-90°; week 2-4: 0-110°). Rehabilitation (30 to 60 sessions, 3 to 5 sessions/week) is started immediately with mobilizations during the first 4 weeks. After 4 weeks, closed-chain exercises are started, with proprioceptive rehabilitation beginning at week 5. Functional exercises are implemented at 5 months postoperatively. Sport-specific exercises are permitted from month 4 or 5, with return to competition after 9 months. Follow-up office visits are done at 6 weeks, 3 months, 6 months, and 1 year. Intraarticular graft insertion areas and tunnel orientation are important in ACL reconstruction. Every technique carries a geometric compromise that prevents a true anatomic reconstruction of the original ACL. Damaging the medial articular cartilage on the tibia is a significant risk when the tibial tunnel is too horizontal. Transtibial drilling of the femoral tunnel can lead to a non-anatomic femoral insertion area if the knee flexion angle is not controlled during drill guide positioning. The AM portal technique suffers from difficult visualization and a sharp killer angle. Thomas Tampere, MD, and Jan Victor, MD, PhD, are from Ghent University Hospital, Ghent, Belgium. Chambat P, Guier C, Sonnery-Cottet B, Fayard J-M, Thaunat M. The evolution of acl reconstruction of the last fifty years. International Orthopaedics (SICOT) 2013; 37:181-186. Takahashi M, Doi M, Abe M, Suzuki D, Nagano A. Anatomical study of the femoral and tibial insertions of the anteromedial and posterolateral bundles of human anterior cruciate ligament. Am J Sports Med 2006; 34: 787-792. Hara k, Mochizuki T, Sekiya I, Yamaguchi K, Akita K, Muneta T. Anatomy of normal human anterior cruciate ligament attachments evaluated by divided small bundles. Am J Sports Med 2009; 37:2386-2391. Zantop T, Petersen W, Sekiya J, Musahl V, Fu F. Anterior cruciate ligament anatomy and function relating to anatomical reconstruction. Knee Surg Sports Traumatol Arthros 2006; 14:982-992. Hwang M, Piefer J, Lubowitz J. Anterior cruciate ligament tibial footprint anatomy: systematic review of the 21st century literature. Arthroscopy 2012; 28:728-734. Asebe E, Utturkar F, Taylor D, Spritzer C, Kim J, Moorman C, Garrett W, DeFrate L. The effects of femoral graft placement on in vivo knee kinematics after anterior cruciate ligament reconstruction. Journal of biomechanics 2011; 44:924-929. Wang H, Fleischli J, Zheng N. Transtibial versus anteromedial portal technique in single-bundle anterior cruciate ligament reconstruction: outcomes of knee joint kinematics during walking. Am J Sports Med 2013; 41:1847-1856. Ho J, Gardiner A, Shah V, Steiner M. Equal kinematics between central anatomic single-bundle and double-bundle anterior cruciate ligament reconstructions. Arthroscopy 2009; 24:464-472. Sim J, Gadikota H, Li J, Li G, Gill T. Biomechanical evaluation of knee joint laxities and graft forces after anterior cruciate ligament reconstruction by anteromedial portal, outside-in, and transtibial techniques. Am J Sports Med 2011; 39:2604-2610. Siebold R, Ellert T, Metz S et al. Tibial insertions of the anteromedial and posterolateral bundles of the anterior cruciate ligament: morphometry, arthroscopic landmarks, and orientation model for bone tunnel placement. Arthroscopy 2008; 24:145-161. 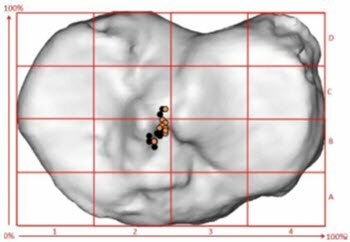 Forsythe B, Kopf S, Wong AK, Martins CA, Anderst W, Tashman S, Fu F. The location of femoral and tibial tunnels in anatomic double-bundle anterior cruciate ligament reconstruction analyzed by three-dimensional computed tomography models. J Bone Joint Surg Am 2010; 92(6):1418-1426. Frobell R, Roos H, Roos E, Roemer F, Ranstam J, Lohmander S. Treatment for acute anterior cruciate ligament tear: five year outcome of randomized rial. BMJ 2013; 346. Dunn WR, Lyman S, Lincoln AE, Amoroso PJ, Wickiewicz T, Marx RG. The effect of anterior cruciate ligament reconstruction on the risk of knee reinjury. Am J Sports Med. 2004;32:1906–13. Fithian DC, Paxton EW, Stone ML, et al. Prospective trial of a treatment algorithm for the management of the anterior cruciate ligament-injured knee. Am J Sports Med. 2005;33(3):335–46. Jarvela T, Nyyssonen M, Kannus P, Paakkala T, Jarvinen M. Bone-patellar tendon-bone reconstruction of the anterior cruciate ligament. A long-term comparison of early and late repair. Int Orthop. 1999;23:227–31. Smith TO, Davies L, Hing CB. Early versus delayed surgery for anterior cruciate ligament reconstruction: a systematic review and meta-analysis. Knee Surg Sports Traumatol Arthrosc. 2010;18: 304–11. Riboh J, Hasselblad V, Godin J, Mather RC. Transtibial versus independent drilling techniques for anterior cruciate ligament reconstruction: a systematic review, meta-analysis, meta-regression. Am J Sports Med. 2013;41(11): 2693-702. Rahr-Wagner L, Thillemann T, Pedersen A, Lind M. Increased risk of revision after anteromedial compared with transtibial drilling of the femoral tunnel during primary anterior cruciate ligament reconstruction: results from the Danish knee ligament Reconstruction register. Arthroscopy 2013; 29:98-105.